If you're like most of us, you've had a smartphone disappear or go non-functional. It's a pain to be without a phone for a few days while you get a replacement, but the real tragedy is the loss of all the personal data. Let's face it, most of us don't have a backup. The bleep charging cable may radically simplify the backup process. To backup, all you have to do is charge your phone. 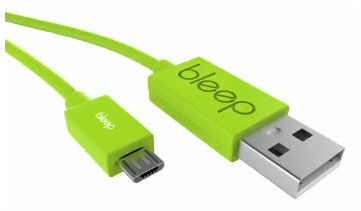 The bleep charging cable is really a brilliant idea. It's a standard charging cable with one big difference....it contains a bunch of memory. Think of it as a charging cable with an integrated memory stick. The cable itself contains between 16 - 64 GB of memory. To get things started, you download an app onto your phone. After selecting your backup settings, you simply charge your phone as normal, using the bleep charging cable. Each time your phone is plugged in to charge, all the data is automatically backed up into the cable. It's that simple. If you choose, the option of transferring your data to computer or to the cloud is provided by the bleep backup app. If you lose your phone or it's damaged, simply plug the new phone into the bleep charging cable and restore all of your personal data. bleep is currently an IndieGoGo project. They're off to a good start and we hope they are funded. This is an idea that has merit. In the future this company plans to create a wireless charging pad and a 'bleep' for cameras.